"Like a painting with a beautiful landscape: groups of trees, gently rolling meadows, fog covered, seemingly deserted. A bit of nature in smooth colors, evenly framed. The countryside in Lukas Marxt’s and Jakub Vrba’s film is, in any case, as the original title says, ruhig gelegen (secluded). At first, not much can be heard apart from the chirping of birds and sounds of the wind. The buzzing of airplane motors then mixes in, and sounds that must come from the man behind the camera. This reference to a human presence in an otherwise seemingly lonely stretch of land is concentrated in instructions that one of the filmmakers calls out to the other from off screen. Hereby established is a test arrangement that symbolically stages human intervention in the landscape. 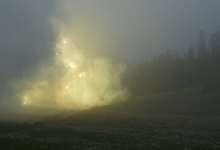 The triggering of pyrotechnic effects produces a thick, white smoke that slowly engulfs the entire picture space. The landscape is covered by a monochrome surface, which lies like a second screen between the gaze and the reproduction. This paradoxical intervention shifts focus to the landscape as a construction manufactured by beholders in such a way that it entirely extinguishes the picture. Like the empty picture, also the picture of the concrete detail of nature alone is incapable of providing information about historical contexts or personal connections (such as the filmmaker).